We cruised out to see Marley and me this afternoon with the kids – a cute movie that had us all in tears as we left the theater. The book was better. I had read the book about two years ago after our first lab (his name was Marley) died at the age of 8 – before his time. He made his best attempt to eat either a pine cone or cob, which caused a severe blockage (the x-rays were inconclusive, but it looked like it could have been either). The chewing and consumption of non edible items is apparently a lab trait, one which we – at times – laughed at. He had eaten it in the evening. We found him laying by our door – barely alive the next morning. 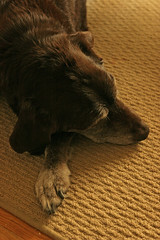 Coco was his older companion, our first family dog – his mom for all he knew. In the years past Marely’s demise, she began showing signs of age. Her hair grew coarser, her sight was failing, gray hairs dominated her muzzle and paws. 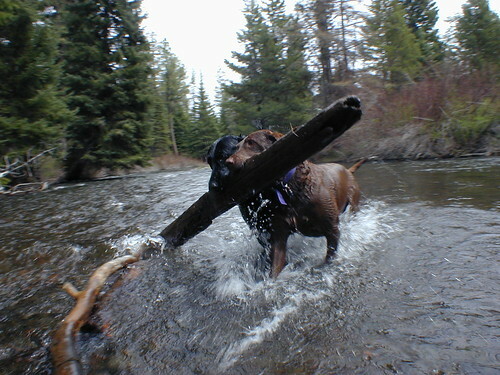 Our frequent trips to the river and parks with her diminished as her enthusiasm for outdoor activities was lack luster. Towards the end she kept her self relegated to her room and to a strict path of – room to food – room to door – door to backyard – backyard to door – door to water – water to room. I can’t remember the last time she had barked, but her tail wagged till the day she passed. 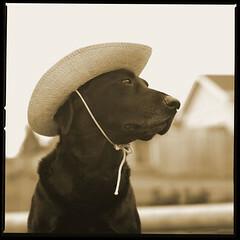 Both our labs were great companions – fun, loving, and inspiring. We miss them for sure. Now we have a Basset Hound, Lucy. We got her on a trip to Portland sometime after Marley had past. We thought it was a good idea to have another dog in the house. Lucy’s puppy energy kept Coco on her paws, and we liked to believe it kept her going. It was cute to see them cuddle up together in the evenings although towards the end Lucy kept her distance, it was interesting to observe. Dogs know, I suppose. We had to put Coco to sleep December 23. We’ll miss Coco – but I’m sure Marley’s excited to see his companion again.